This April is check your helmet month. Please check your helmet to make sure it is still safe to ride with. Helmet safety is no joke! If your helmet is expired it is time to think about getting a new helmet. If you do not know how to check your helmet please call us at #888 593 0891 or come into the store and we will help you ensure you are riding safely. 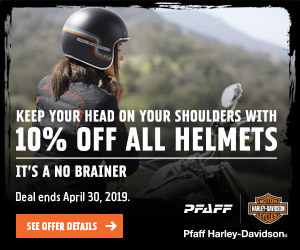 To help out Pfaff Harley-Davidson® is offering 10% off all helmets. To see our inventory of helmets please *REFER HERE* and search for helmets with the filter on the left. Make sure your helmet is not older than 5 years. Check the manufacture date on your helmets EPS liner. Consider the state of your liner. Clean your liner properly from sweat and water to avoid it losing its shape. Check the EPS. If the foam is worn, cracked, ripped or compromised, it may be unsafe. Talk to a professional. Bring your helmet into your local Harley-Davidson® Dealership and ask a professional to check your helmet for you. Take into consideration that the technology in helmets improves every year. A new helmet may have significant improvements compared to an older helmet. Deal is available from April 1st to April 30th, 2019.